For the Jenkins team, taking the project from design to construction is simple. The hand-off from the design department to the construction team consists of several meetings to ensure the on-site Construction Manager understands all the construction documents clearly. By the way, if you missed Steps 1 through 3, find them here. “End of project” management inspection and project review with Shan. 6,11, and 23-month quality assurance inspections. Sometimes you need to live in your home for a while before you notice minor cosmetic needs. 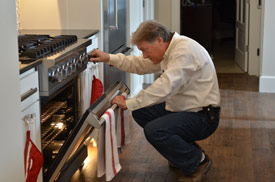 Jenkins Custom Homes’ online warranty request system allows you to log any items that need attention, which we then come out and take care of on your quality inspection date. 2-year home warranty. We offer a comprehensive 2-year home warranty to further insure that you get the home you deserve. This is double the industry standard, and we make it very easy with our MyJenkinsHome.com web-based communication system. 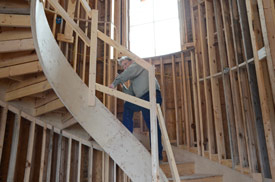 Building a home can be time-consuming. That’s why we developed our web-based Homeowner Home page, which includes our complete project management system and smart phone app. 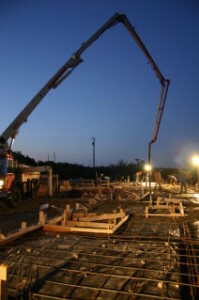 Our two-year warranty covers: lot grading & drainage; foundations & slabs; exterior concrete flatwork; framing; wall, ceiling, & beam tolerances; sub flooring & stairs; drywall tolerances & imperfections (blisters, cracks, seam lines, etc. ); insulation; exterior siding & trim; masonry; stucco; roofs (flashing, vents, louvers, gutters/downspouts, shingles/tiles, etc. ); doors & windows; carpet; finished concrete flooring; wood flooring; hard surfaces (ceramic tile, flagstone, marble, granite, etc. ); painting, staining, wall coverings, plumbing fixtures, & accessories; pipes & vents; heating & cooling; ductwork; electrical fixtures (including smoke & CO2 detectors); interior trim; closet shelving; mirrors; glass shower doors; hardware & ironwork; fireplaces; irrigation systems; fencing; pest control; electrical delivery systems; electrical wiring/panel/breakers/fuses; electrical outlets & GFI; wiring & outlets (for cable TV, telephones, Ethernet, etc. ); plumbing delivery systems; wastewater treatment system; HVAC delivery systems; refrigerant line; heating & cooling functions. At Jenkins, we do more than build great homes. We protect them with an exceptional warranty to give you the best compliment to luxury: peace of mind. We look forward to discussing how we may serve your unique needs.